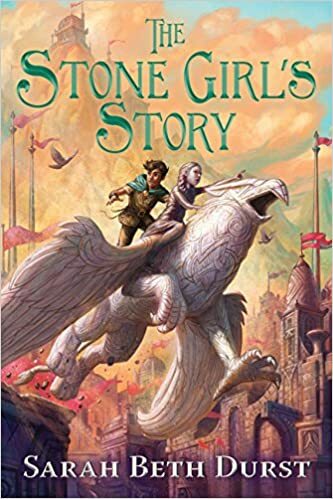 My Thoughts: THE STONE GIRL'S STORY is a wonderful middle grade fantasy. Mayka is a girl who was carved of stone by Father who also carved many other creatures: birds Jacklo and Risa, rabbits Dersy and Harlisona, the owl Nianna, Etho the lizard, Turtle, Badger, the cat Kalgray, and the fish. But Father died many years previously and the marks he carved into their stone are fading. When they have faded enough, all the carvings stop. Recently Mayka's friend Turtle has stopped and she is grieving his loss. She decides that the only thing for her to do is to venture down the mountain from their home to the valley below to find a new stonemason to recarve the marks needed to keep her friend and herself alive. She was planning to go alone but Risa and Jacklo decide to follow her and join her on the adventure. And what an adventure it is. On their journey, they meet many people. Some are dangerous and want to return them to their "Keeper" in the hopes of a reward. Others are kind like the young girl Ilery who is also visiting the city of Skye and Garit who is an apprentice stonemason. They also meet a carved small dragon named Si-Si who has been forgotten by her owners and who was made as a decoration but wants to rewrite her story to make herself useful and heroic. Most troubling of all those Mayka meets on her journey is Garit's Master Siorn who has discovered something new - a way to add a mark of obedience to all his stone carvings. Siorn is hoping that his discovery will raise the status of stonemasons who have been distrusted since the Stone Wars but Mayka is appalled that someone else would take control of stone creature's stories. She needs to find a way to rescue Jacklo was was captured by Siorn and had a mark of obedience carved on him. But that isn't enough. She needs to find a way to stop Siorn from convincing others to use the mark. This was a wonderful coming of age story as Mayka learns about her own strengths and learns that she is rewriting her story as she changes because of her adventures. It was a wonderful story of friendship and the lengths people go to for their friends. I loved the idea that everyone is the author of their own story. I highly recommend this book for is lyrical language and engaging heroine. This was it, the noun she hadn't recognized, beside the mark for stonemason. It was Master Siorn's name. The mark she hadn't recognized was his name, combined with the inverted sign for "lead." which could be read as "obey." He'd made that a part of all the creature's stories. Obey me, he's written on their bodies. She was certain she was reading it correctly, and equally certain they had to leave. Right now. I received this one in exchange for an honest review from the author. You can buy your copy here.